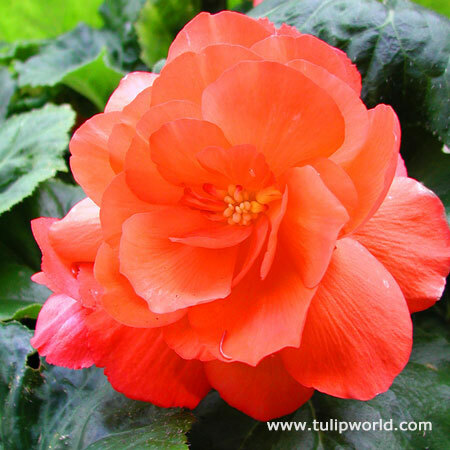 This basic begonia produces double and large flowers in vivid orange color. Excellent for pots and containers, this one will be a wonderful addition for your summer garden. As other begonias, this one also blooms until early autumn. Our Begonia tubers are a large and plump 2.75" across (7+ cm), the bigger the bulb the bigger the plant and therefore more blooms for you to enjoy! Start tuberous begonias indoor in late February for earlier summer blooms! The tubers in this color arrived very soon after I placed the order and all of the tubers were large and in good shape. Some already had growth started and all have started growing now.